The tradition began in 1948 and is carried out by the 3rd U.S. Infantry Regiment, nicknamed "The Old Guard"
Sgt. 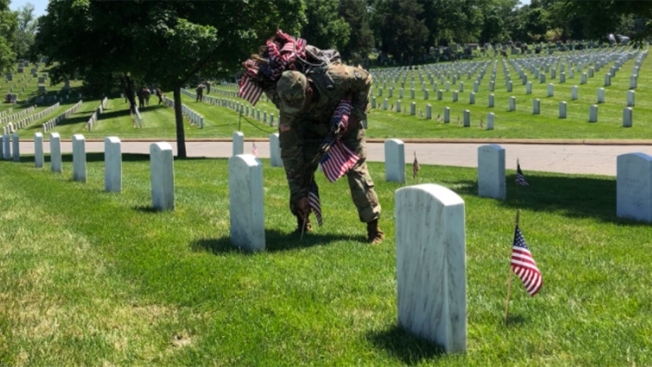 Armando Miller of the 3rd U.S. Infantry Regiment places a U.S. flag on a headstone in section 34 of Arlington National Cemetery on May 24, 2018. Soldiers adorned nearly a quarter-million headstones with U.S. flags at Arlington National Cemetery Thursday to honor America's fallen military heroes. The annual "Flags-In" tradition marks the beginning of Memorial Day weekend events at the cemetery. The tradition began in 1948 and is carried out by the 3rd U.S. Infantry Regiment, nicknamed "The Old Guard." This year more than 1,000 soldiers "are placing 234,537 flags at every headstone and at every column in the Columbarium and niche walls," the cemetery said on Twitter. The soldiers also place about 14,000 flags at the Soldiers' and Airmen's Home National Cemetery in Washington. The flags are removed after Memorial Day.